Photo: Watching the Waterford III facility from Norco. By Darin Acosta. Recently I sat down with geographer and media-maker Darin Acosta, to discuss his web application German Coast* (http://germancoast.verylongroad.com/) and how having grown up in Louisiana’s “Cancer Alley" grounds his work. Darin: I’m Darin Acosta. I grew up in Norco, Louisiana. That’s influenced a lot of work and research that I do. Most of my creative output centers around industrialization in the River Parishes. I went to graduate school for urban and regional planning at UNO (University of New Orleans), where I learned GIS (geographic information system), so I apply GIS to my creative work in order to introduce users to environmental justice histories in the region that I grew up in. Ada: How did the German Coast project come to be? Darin: When I was 15, I found a thesis that someone had written about Diamond [the historic Black community in Norco that has been relocated and displaced by the Shell refinery]. I went to Kinko’s and just xeroxed this thesis, and would hand it out at shows and stuff. That was the first zine I ever made. That was the first time I tried to publicize what was going on in Norco. And ever since then I’ve been slowly, incrementally building up a library of knowledge and media and information about industrialization in Norco and the river parish region more broadly. So a lot of that media and that research is what’s been poured into the German Coast. I collaborate with Breonne DeDeceker, who is a photographer and researcher and fellow anti-capitalist who is also interested in these narratives. We collaborate a lot on video stuff. We made one video about the West Indian hurricane of 1915 It was an interview I did with Donald Tregre, who is my grandfather-in-law. He weaves interesting narratives about urbanization and environmental disaster into the interview. On the map I created this user experience where events are happening on the map while he is speaking [check it out]. A lot of this media I am integrating has already been produced, so it’s about recontextualizing it or applying it to a new digital environment. It’s been a long process of accruing all of this knowledge and media and applying it to the program. I started developing the program itself probably about six months ago. Ada: Why does map-making do it for you? Darin: I’ve always been more intrigued by landscapes than people. I think that was the start of it. The way I got interested in this stuff is that I find industrial landscapes visually, aesthetically fascinating. So when I got into college, and I had access to GIS, it was fun. This was before google maps, and I had access to aerial imagery of Norco and the refineries. I thought it was interesting to just be able to see beyond the fenceline. So I was able to create maps of those. They were real crude. Then I found this cache on the Louisiana Oil Spill Coordinator's office, they have so much data about oil infrastructure. When I was able to pull in that data I was hooked. You could see the pipelines and injection wells, and all of this architecture of the oil industry. And found that really fascinating and started making maps of that. Simultaneously, UNO was getting gouged, and all of the state funding was drying up, the Planning Department needed a free web developer. They couldn’t pay me for it, but I volunteered to do it. So I was learning HTML simultaneously while I was learning GIS. Now I’m at a point where I’ve developed those skills enough where I can create online geographic experiences. 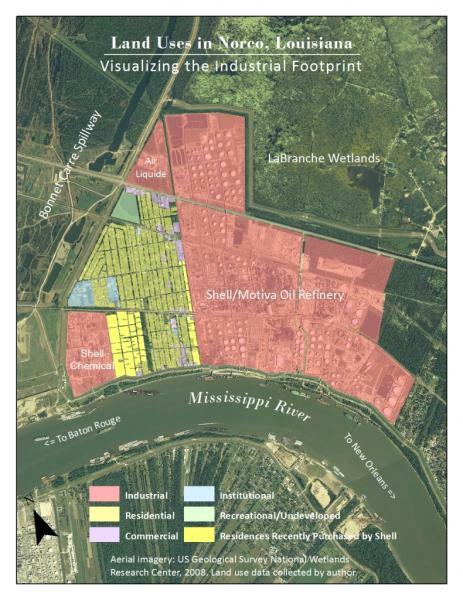 Image: Land Uses in Norco, Louisiana map by Darin Acosta, see larger version here. Ada: Tell me a bit about growing up in Norco, and what it’s like to live in New Orleans now. Darin: Growing up in Norco, it was just normal for me. I grew up five blocks from the fenceline of the Shell oil refinery. I was always very fascinated by that skyline. When I was very young I was confused about exactly what it was. I thought it was some sort of urban area. My friend Jeremy, who grew up two blocks away from me, thought that Shell was New Orleans, until he was like 9 or 10. And he would always ask his parents why they wouldn’t go visit New Orleans. All my family works at the refineries around there. I grew up a few blocks from Diamond, and I had friends who lived in Diamond. It was always lively, a fun community to visit. The Bonnet Carré Spillway – it was great having that, vast open space. You know, Norco was magical. It was my childhood – a lot of nostalgia there. A lot of access to the outdoors, the wetlands. The one thing I did understand early on was that visually, it was distinct. That was something I never lost sight of and carried with me. I got into punk rock and radical politics when I was a young teenager. I would go to shows and stuff, and be a total hype man and promoter of Norco. I was like “Y’all need to come to Norco!" My friends would start coming out there and we’d have slumber parties. Bands that would play at shows would come stay at my parents’ house. We would always have parties out there and stuff. That was me starting to get more integrated into the New Orleans social environment. Pre-Katrina, it was just that sort of blissful, naive, fun, punk rock lifestyle, where I was bouncing between Norco and New Orleans and going on tour a lot. After Katrina, it was a total bummer, and really difficult to be here. A lot of my social network had gone elsewhere, California and other places. More recently, as New Orleans becomes more Brooklynized, it’s been a pretty alienating experience, actually, for me. I hate to say it that way because I know that it impacts other people in more direct, concrete ways. But I still love it. I don’t know, that’s a tough one. That’s a whole interview right there. And I definitely don’t want to piss off or alienate readers who have moved here more recently. Darin: Yeah, you’re totally on point with that. Industrialization and deregulation of various kinds leads to residential displacement. Image: Screenshot from a section of the German Coast application that overlays an 1858 map of plantations on today's landscape. Ada: Who are you trying to touch or move with your work. What’s your hope for its impact? Darin: With the German Coast, ultimately I want it to be very, very useable, very accessible. My target audience in my head was high school students. When I was a young person and learning about environmental justice I was hungry for media. I couldn’t find that much. There were a lot of environmental justice authors, I found their work really interesting. But I was also really into video games and digital media and movies. I want young people who can engage with this kind of media easily to just be able to play with it, and I want it to be an interactive experience. Especially young people from this region, so they can start to build some awareness about what’s going on if they’re from New Orleans, what’s going on out in the River Parishes or the suburbs. If they're from the suburbs, they can find out about their own history. That’s the baseline audience in my head, ultimately. But it’s also just for everybody. It’s free and it’s on the web, so I want anybody to use it. And other collaborators. I want good java script developers to get involved. I want people who are environmental justice-minded, and people who have personal experiences growing up in those communities to get involved. I’ll soon make it public on Github [a site where other developers can use and adapt the code for free], I’m just cleaning up the code right now. Ada: What are some of your other projects? Darin: Me and Breonne do a lot of work that we informally call “Airline" or “The airline is a very long road”. We make films, we write for various blogs and publications, do photography stuff, periodically; do installations. Other than that just random personal art projects, for me and my friends. I made this trilogy of film shorts about my friend Nathan, while we were on tour. And in each one he is a different kind of sociopath. Just things like that. Ada: Do you have a message that you want to put out there about Norco or Louisiana or the Gulf Coast? Darin: It’s always been a visual experience for me. The experience of Norco. I’ve always had a physical and visual sense that wetland loss is occurring and that industrialization is happening. My dad had a camp in St. Bernard Parish. They lost it during Hurricane Katrina. All of the channels and bayous out there near Delacroix were disappearing over my lifetime and the time he was going to this camp and fishing. So I always had a picture, an idea of what that looked like. I think using digital geographic tools is a good visual medium for me to express what industrialization and environmental degradation look like. The physical and visual extent of the impact of those things. My message is a visual message. Ada: I was thinking this morning about the video of the Walter Scott shooting. In that case the cop is being charged with murder. But in Eric Garner’s death it doesn’t matter that it’s captured visually, the indictment didn’t happen. I used to have this assumption around media production and advocacy that if enough people knew, if there was enough proof or evidence, than hearts and minds would change. And then you see people online being like, “He shouldn’t have been running away” [justifying why it was ok for the cop to shoot Walter Scott]. So, does visualizing oppression just create a new normal, “Well, that’s what the world is like?" Darin: That’s a super good question, let me think about that for a second… One thing is that I definitely think direct action is way more useful. It’s hard for me to participate in it these days. I have a job and other responsibilities. So this is the capacity in which I can serve movements that I think are meaningful. I think if you contextualize it in the right way it doesn’t normalize it. The way that the popular media usually contextualizes things — well they don’t, they scarcely contextualize it, that becomes the normal. But I think if you can communicate the message and have people understand the broader context, then I think it helps piss people off and make people reasonably upset. At least that’s been my experience. I certainly hope that I’m not normalizing environmental racism. But that’s something worth self-reflection. Ada: I also think its not all on the media-makers to figure it all out, it’s also on people, “Why is this not moving us?” And the connection to thinking about serving movements that are engaged in direct action, instead of, “This [media] is all that I do." Darin: I’ve been struggling with that kind of stuff a lot lately, as I grow up and become an adult and not a scrappy awkward punk kid. I think one thing is that the people personally in my family that I show this to, I know that it helps guide their thinking about it. Just engaging people about this stuff and presenting the media that I produce, I do think from my experience has either changed or influenced enough minds to where it’s encouraging. And also, it’s important not to let industry dominate the narrative. My parents get this publication every week or month from Shell that’s like, "here’s what we’re doing in the community.” Like, “we gave some computers to all the kids at this public school. We beautified river road and put up shrubs.” So if my parents are receiving that media and that message and it’s dominating the narrative in their community, its important to put out accessible media that counteracts that narrative. People in New Orleans read indy media, but my parents don’t read indy media. So if you have something that they feel compelled to look at or it’s interesting to them, I think it’s good. It helps. *NOTE: German Coast is still in the development stage. Not all content has been written. It doesn't perform well on all browsers and devices. Using it in Google Chrome on a non-mobile device is the best experience as of now, but that will improve as development continues.